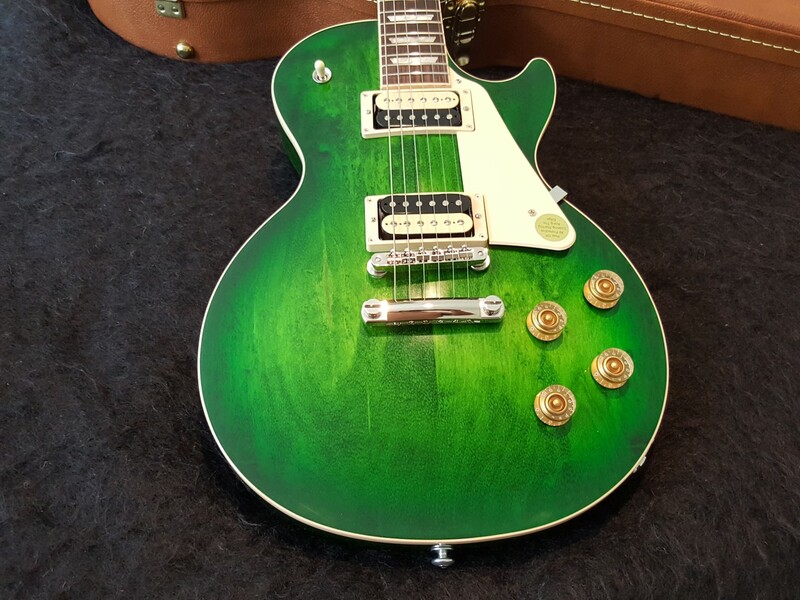 Brand new Gibson 2017 Les Paul Classic - Ocean Green Burst. Genuine made in USA. Mint, not been a demo in a store. The Les Paul Classic 2017 T riffs on the beloved guitars of the '60s and '70s while adding modern upgrades for tone and playability, yielding a true Classic with contemporary twists. A Grade-A plain maple top on a mahogany back with 9-hole weight relief combine for subtle beauty with enhanced resonance and superb playing comfort. The solid-mahogany neck has a fast slim-taper profile, a thicker rosewood fingerboard with 22 super-smooth polished frets for easy bends, and a genuine nylon nut. Zebra '57 Classic humbuckers with orange drop tone caps ensure sultry PAF-like voicings, while a nickel wired ABR bridge and aluminum stop bar combine for solid sustain. Gibson USA gently rolls the fingerboard binding for a neck that never felt so good, and Grover locking kidney tuners provide an accurate and long-lasting performance. Gold speed knobs add an elegant touch. Delivered in a classic Gibson brown hardshell case with a Gibson multi-tool, a premium leather strap, and a polishing cloth. Special electronics: Hand-wired with orange drop capacitors.